Classic Tips: Where to Go for Your First Flats-Fishing Trip. Be sure to check out my hosted trip to Punta Allen Mexico. It won't disappoint. 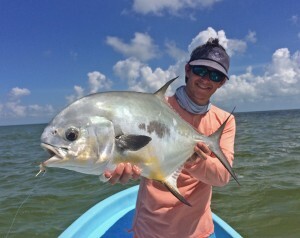 La Pescadora – Mexico Fly Fishing: Located just south of the small fishing village of Punta Allen on the Yucatan Peninsula, is one of the best fishing focused lodges in the Caribbean and not to mention one of the best values in destination travel fly fishing. With direct access to the famed fisheries of Ascension Bay and the surrounding lagoons, La Pescadora offers guided fishing on some of the best saltwater sportfish habitat in the world and is home of the WorldCast Anglers Black Tail Invitational. 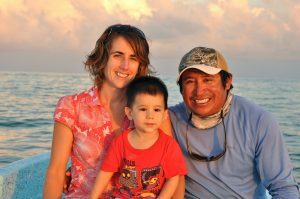 On-site managing partners Jose Ucan and Lily Bertram have been involved in the fishing business of Punta Allen for over a decade combined, helping them create a wonderful fishing oriented experience at La Pescadora. Opening on February 1st, 2013 with a newly constructed lodge, La Pescadora overlooks a “home” turtle grass covered bonefish flat with terrific views of the nightly, sunset burnt sky above the Caribbean Ocean. La Pescadora features a main lodge with four single level double occupancy cabins flanking both sides. All of the buildings are decorated with exposed mahogany and cedar wood for an elegant and aesthetic touch that seems quite fitting for the open floor plan and beachside location. Each cabin has a private bathroom, two full sized beds, screened windows, shelving and storage area for gear, a ceiling fan, air conditioning units and small deck with a personal hammock. The main lodge features an open air bar and dining area with an additional common space upstairs. Between these spaces and the lodge deck’s two sitting areas, La Pescadora offers some great settings for post-fishing beverages and appetizers. All meals are prepared on site by local chefs using many ingredients sourced from the region, combining traditional Mayan cuisine with Caribbean and American influences. The bar is fully stocked with an ice machine and a variety of liquors, wines, sodas, mixers and ice cold local beers. La Pescadora offers some of the best shallow saltwater fly fishing in the world with the opportunity to catch a super grand slam (permit, tarpon, bonefish and snook) every day of the year. This is not to say that fishermen do accomplish a super grand slam everyday but these species are present in healthy numbers throughout the year around Ascension Bay. La Pescadora’s specialty is permit fishing as the lodge hires some of the best guides in Mexico who have a deep passion for guiding their clients onto these demanding fish. The lagoons and river system located inland from Ascension Bay provide blue ribbon snook and baby tarpon fishing while casting to bonefish is always possible in the skinny flats. La Pescadora utilizes 23 foot super pangas with two guides for every boat. Having a primary guide and an assistant guide allows fishermen to sight fish from a distance, jump out of the boat and stalk fish on foot which helps minimize the casting distance and can often lead to numerous opportunities at the same fish. La Pescadora is a must visit destination for saltwater flats enthusiasts and beginners alike as it not only offers a variety of the best fly fishing in the Caribbean but it also emphasizes fishing above all other activities at an amazing price. For more information through the WCA Website, visit this link. Copyright © 2017 Kevin Emery / Fly Fishing Guide at WorldCast Anglers, All rights reserved. You're receiving this email because we have fished together at WorldCast Anglers. Victor, Idaho & Jackson, Wyoming. Happy New Year 2017 Wishing you a very special year filled with good health, world travel and quality fishing experiences. When you're ready to change the look of your email, take a look through the “design” tab to set background colors, borders, and other styles. One of the all time best fly and a true top ten in my fly box.